Mindfulness is at its highest when the body-mind connection is challenged to adapt movement to external demands. This is what Natural Movement is all about. Many who come to us from the Yogic tradition are looking for ways to promote mindfulness in movement beyond the traditional poses, as well as outside the studio. Many are looking for new and different class offerings at their studio, or for new practices to introduce into their existing classes. Natural movement provides all this, and more. The practice of Natural Movement promotes an awareness involving the Body, the Mind, & the Environment. When you add simple environmental elements like a beam, the body-mind connection must open itself to the world around. It must open and mindfully adapt to it. This requires high levels of mindfulness because the immediate environment becomes to complex to be ignored. You must become one with it. Working together is a core principle of Natural Movement. The throw and catch practice demands high levels of focus, but also provides interaction between practitioners. We are not just doing the same thing at the same time next to each other, we are doing together something we couldn’t do alone. We have clients that offer natural movement exercises during their yoga teachings. We have clients that offer a complete Natural Movement class at their studio, in a minimal environment suitable to both practices. We have clients that simply want to learn more about movement. 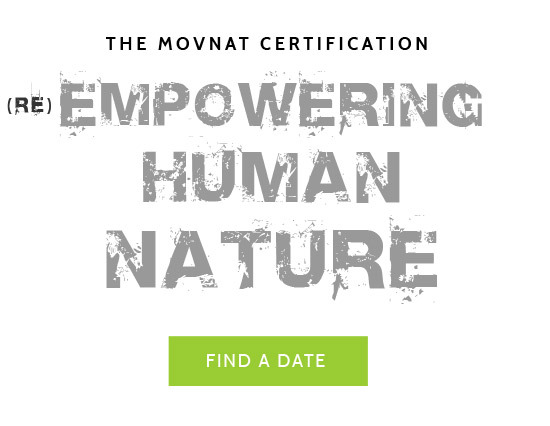 The MovNat Certification exists for precisely these purposes, and more.